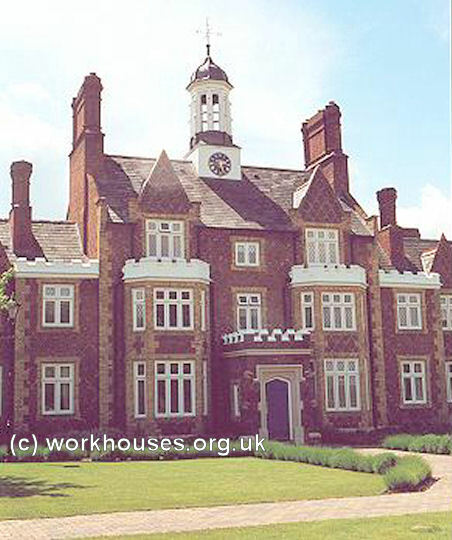 Windsor's first workhouse was set up in around 1731 (Bond, 1945). It was erected on the site of the old pest-house at a cost of £1076 16s. 8d. of which £500 came from a bequest of Richard Topham for "procuring a convenient workhouse for employing in useful labour, the poor of the parish." The remainder of the cost of the workhouse was donated by Mr Justice Reeve. The building included a work-room, an "Eateing Room", a pantry, a "Wett Larder", a kitchen, a Master's room, a stores-room, a brew-house, and a wash-house. 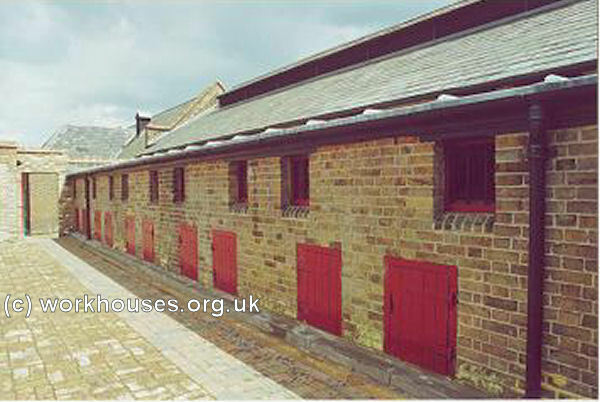 A parliamentary report of 1777 recorded that Windsor's workhouse could house up to 90 inmates. The Poor are either relieved at home, or in a Poor-house, which is a very convenient building, and seems to be kept tolerably clean. Feather beds are used. There are 6 or 7 in each room; 2 sleep in a bed. 96 paupers, chiefly old people and children, are at present in the house. The latter are instructed in reading till they are 7 years old, and are then put to a free school, where they are clothed and educated till they are 14, when the boys are bound apprentices till they are 21, with an apprentice fee of £10, arising from the interest of donations bequeathed for that purpose. In the Poor-house linen and stockings are manufactured for the use of the house. For all other work, which consists in picking hair, wool, etc., for other manufactures, the Poor are allowed 2d. in every shilling they earn for the house. Their annual earnings do not exceed £20 to £25 a year. 75 regular out pensioners receive £81 11s. 10d. a month. About £100 are paid annually to casual Poor. The parish books were not accessible, but from the information of the overseers it appears that the rates have not varied much in 20 years. In 1794, 2s. 6d. on a low-valued rental; in 1795, 2s. In addition, the King pays £100 a year Poor's Rate for his possessions in the parish, and £20 a year towards repairing the church. Table of diet in the Poor-house: Breakfast, every day— bread and broth; Dinner—Sunday—Mutton and vegetables; Monday, Wednesday, Friday—cold meat; Tuesday, Thursday—Beef and vegetables; Saturday— Bread and cheese. Supper, every day—Bread and cheese for adults; bread and butter for children. At dinner and supper a pint of small beer is allowed to a grown person, and a less quantity to children. Women who can procure themselves tea and sugar have bread and butter at breakfast, instead of broth. About £300, of which £100 were given by His Majesty, were collected last winter and spring (1795) in voluntary contributions, for the Poor. Bread was bought and sold to them at reduced prices; about £150 of the money still remain with the parish officers, and will be applied to the relief of the Poor next winter. The houses within the limits of the Castle do not belong to this parish. 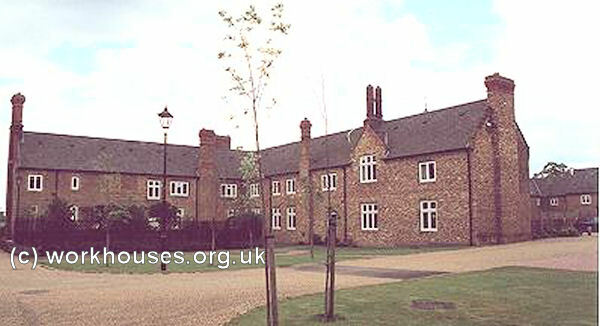 The Windsor workhouse was still standing in 1850 when it was described as "an extensive building surrounded by a courtyard, situate in Sheet St., with a large garden at the back, containing altogether about half a acre." (Tighe and Davis, 1858). Berkshire: Clewer (3), New Windsor with Dedworth (5), Old Windsor (2), Sunninghill (2). Surrey: Egham (4), Thorpe (2). Later Additions: Clewer Within (from 1894), Clewer Without (from 1894), Sunningdale (from 1894), Windsor Castle precincts (from 1866). The population falling within the Union at the 1831 census had been 15,986 — ranging from Thorpe (population 455) to New Windsor with Dedworth (5,328). The average annual poor-rate expenditure for the period 1832-34 had been £8,368. The Windsor Union was the last of the Unions to be formed in Berkshire, some delay having been caused by local party politics. Some strongly Tory parishes around Windsor objected to being united with the parish of New Windsor which was noted for its highly radical leanings. The dispute was resolved by the addition of two parishes from Surrey. The new Windsor Union workhouse was built in 1839-40 to a design by Scott and Moffatt for 282 inmates. It was located at a site in Old Windsor on the western side of Crimp Hill. The site location and layout are shown on the early 1900s map below. Windsor workhouse from the north-east, early 1900s. In October 1840, the inmates of the old Windsor workhouse on Sheet Sreet were transferred to the new union workhouse. It was reported tby one anti-poor-law paper hat "Many of the old creatures shed tears upon being removed from the comforts they had hitherto enjoyed, to be exchanged for the miseries and the restraints, and the hard fare of a 'union.' Several manifested a disposition not to be removed and one poor man (who had doubtlessly heard of the inhumanity practised at 'unions'), resolutely refused to be taken, except by force. He was immediately handcuffed and dragged away." Shortly after its opening, Prince Albert paid a visit to the new workhouse. Although his visit was apparently unexpected, and few preparations had been made to receive him, he was said to have expressed himself highly delighted at the admirable arrangements throughout the extensive building. 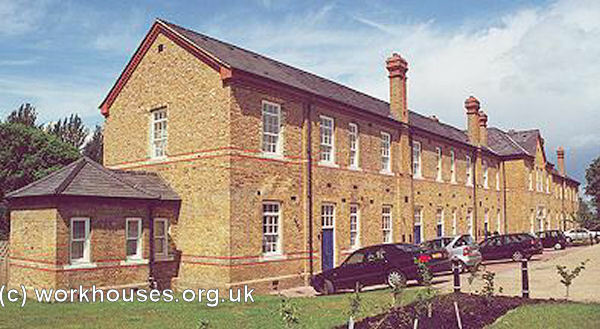 Queen Victoria herself visited the workhouse on 21st March 1864. In a tour lasting ninety minutes, she visited all the wards, the chapel, and finally the board-room where she signed a book. 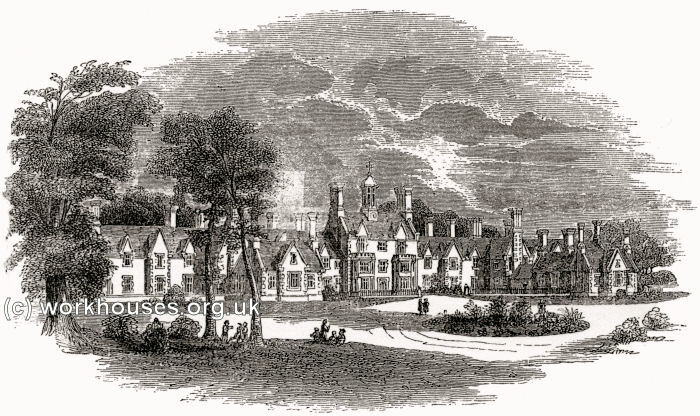 Windsor workhouse from the east, 1841. TWO HOURS AT A UNION WORKHOUSE. [The workhouse] is situated in the parish of Old Windsor, on the verge of the Great Park, at a spot known as Bear's Rails. The road which passes it leads to Bishopgate and Englefield Green, where the stranger finds himself amongst the beautiful scenery with which the neighbourhood of Windsor abounds, particularly in this locality, which is the scene of Denham's celebrated poem of "Cooper's Hill." The Union Workhouse harmonizes with the cheerful peeps over the valley of the Thames, and the massive and venerable trees which form the charm of these woodland solitudes. It is built in the style of two centuries and a half ago, when comfort and elegance, the growth of security, had displaced the rude fortress-mansions of the feudal lords. The area which surrounds it is separated from the public road only by light palings. The court before the central building is bright with flowers and green turf; and the well-directed industry of the inmates is rapidly converting two large plots of waste land, above and below the building, into profitable kitchen-gardens. But let us enter. At the central door we are met by a porter, who communicates to the master of the workhouse our wish to see the building. We are shown into a neat room (that on the right of the door); the opposite room is the master's office. The inmates have recently dined. We taste the food which has constituted their meal; and we acknowledge that the suet pudding, the bread, and the cheese are, in quality, equal to what may be found in the larders of the wealthiest. But then, the quantity? How many poor children get up hungry from this scanty meal ? How many aged persons want some comforts besides soup, and gruel, and pudding, and boiled beef? We have been taught, very industriously, to think that there is a pinching dietary in these workhouses; and though the food is unquestionably good, is there enough of it ? Such thoughts must cross the mind of the stranger who has heard of anti-poor-law orators and writers. But there may still be a great deal of misery though the rooms are cheerful, light, airy, clean even to a Dutch housewife's cleanliness. Let us proceed. The men's dining-rooms on the left of the centre are empty. We go onward to their sitting-rooms, which communicate with yards or courts, in front and behind. The men are separated into two classes — the able-bodied, and the aged and infirm; and each have their allotted stations. The old and infirm are quietly sitting after their meal, — some in the bright sunshine, some in their ward. A few are reading. The able bodied (at this season a small number) have gone to their allotted work, either in the garden, or in picking oakum, or in cleaving wood, or, if they practise any trade of general utility, such as that of the tailor or shoemaker, in labouring for the common benefit. The boys are with the schoolmaster. We see here a healthy set of lads, well clothed, perfectly clean, with smiling and assured faces, learning to read, to write, to cipher, under the direction of an intelligent young man, who looks, in the performance of his duty, as active and cheerful as the boys themselves. We proceed up stairs to the sleeping-rooms. The whole upper range of the building, which is about three hundred and sixty feet long, is a series of rooms, accessible by several staircases, but communicating, in their entire length, with the master's and matron's apartments in the centre. These rooms, as the lower rooms, are subdivided into the bed-rooms of the able-bodied men, the aged, the infirm, and the boys. On the opposite side of the central building are the sleeping-rooms of the aged and infirm women, the able-bodied, and the girls. Throughout the entire range each has a separate bed; and in looking at these beds (and we were invited to a careful examination of them), it is impossible to doubt that the most vigilant cleanliness presides over the establishment. The ventilation of these sleeping-rooms is perfect. Upon descending into the ground-floor on the right of the centre, we are in the female day-apartments. These are upon the same plan as those of the males. The old women who are not infirm are comfortably seated at their knitting and sewing; some are reading the Book of Life, — that best consolation under every condition; some are walking in their sunny court, and perhaps the thought of their tea (for they have tea) is a pleasant anticipation. The girls are with the schoolmistress. They are learning to knit, to sew, to read, and to write. All can now write. A year ago, when the Union was first opened, scarcely any could write. An intelligent girl or boy, who desires to know something more than is to be found in the school-books, may have a book out of the library, and so may the adults. We have seen nothing yet of actual misery; we have scarcely observed a face in which there is a lurking discontent. The food, though not luxurious or improvidently distributed, must be abundant; for we have beheld nothing but health. We know that health is dependent upon cleanliness, ventilation, and sufficient food. Here are undoubtedly cleanliness and ventilation; and the food must be ample for the purposes of health, or there would be sickness. But there is an infirmary to be seen. Here, indeed, there is some wretchedness, but it is that suffering which we find in the wards of a well-conducted hospital. The sufferer has come here for relief. Here is the paralytic, whose continued abiding amongst us must be rendered as little burdensome as may be; here is the cripple, who is incapable of labour or of exercise, and his pains must be soothed under the eye of surgical skill; here is one who lost the use of his limbs in the last hard winter, and he is fast recovering his strength and his ability to work. The patients tell us that every comfort which they require is within their reach; that every nourishment or even indulgence which they want is instantly given, upon the order of the medical officer. We are satisfied that the sick are well cared for. The kitchen, the laundry, and the chapel complete the inspection of the building. 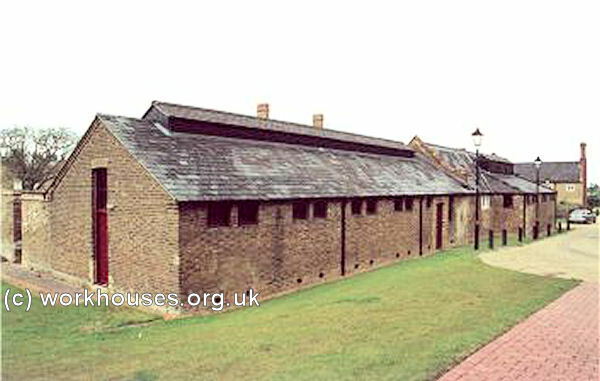 The total cost of the workhouse was £10,014 (£361 for the site, £7,080 for the building, and £2,573 for furniture etc.) The building was was carried out by the local firm of Bedborough and Jenner. It comprised a long main block running north-south, with two pairs of cross-wings to create a double-cruciform layout. Women's accommodation was to the north, men's to the south. A separate 50-bed infirmary stood to the rear. Windsor entrance from the east, 2000. The battlemented Elizabethan-style building was somewhat in contrast to the rather more severe earlier designs encouraged by the poor Law Commissioners. Windsor female accommodation wings from north-west, 2000. In 1898, a new infirmary block was added at the north of the site, at a cost of around £8,500. Windsor infirmary block from west, 2000. To the south-west of the site, a large ward was erected for casuals (tramps). The tramp ward had a row of cells used for stone-breaking. The small pieces of broken stone fell through a grating in the cell wall into a hopper outside. The small stones were sold for road-making. 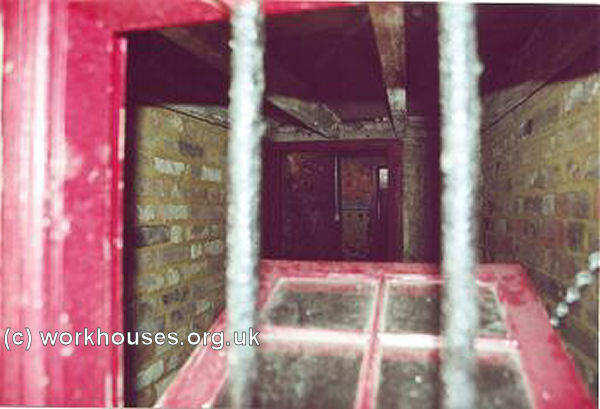 Windsor interior of stone-breaking cell, 2000. There were no indoor water-closets (toilets). The main night-time facility was a large tub placed on each landing which was carried down the stairs and emptied each morning. The female venereal wards were overcrowded and badly ventilated. On Wednesday August 1st, my attention was called by the Matron to the Nurse. I went and saw her about 9.30pm and found her drunk. I took the keys from her and ordered her to bed, and told one of the inmates to see all lights out. About 10.30 the Matron visited again, and found her up. She had gone into the Women's Ward, taken up a Poker and forced the lock off her Sitting room. She refused to go to bed. I then went over again, and thinking she had drink in her bedroom the Matron insisted on seeing in. She refused to allow her, and we went in by force. We found the Room in a dreadful state; strewn all over with rags, and at least 20 vessels, viz Chambers, Jugs, Cups &c. full of filth, Vomit, urine &c.; The stench was unbearable. The next morning I went to the Chairman, who saw the state of things. Drs Drew and Andrew were sent for and saw it also. I then commenced to turn out her drawers, and found every drawer full of dirty rags, and linen: 40 hand towels; 15 chamber ditto; 10 blankets; 14 sheets; 11 Neckerchiefs; 9 Pocket handkerchiefs; 11 Pairs of Hose; 9 Babys' Napkins; & 2 Night Caps. These should all have been clean, and in her drawers when not in use, besides a large quantity of her own linen in a filthy state. The carpet is spoiled and the bed not yet fit for use. It took 3 days to get the rooms clean and fit to be occupied. She left the House the same day. 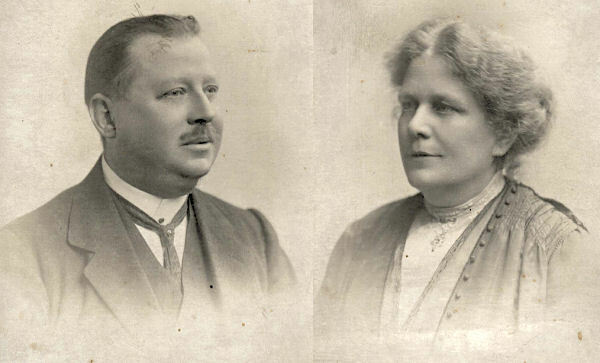 In 1922, the master and matron of the workhouse were George Henry Austin and his wife, Annie Sarah Austin (née Randall). In that year, Annie recorded that she had received a chocolate Easter egg from Queen Mary and had also received flowers when the Queen had been in residence at Windsor Castle. The picture of the Austins below was kindly contributed by a family member Marian White. 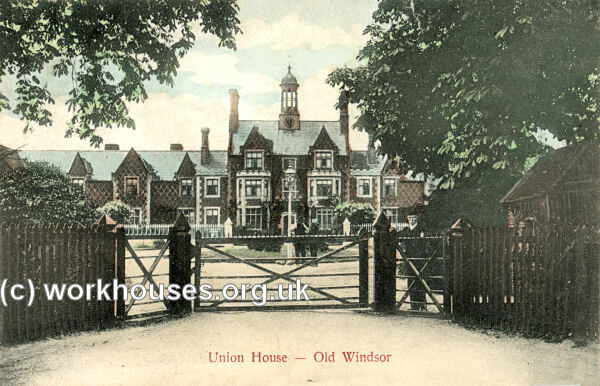 The workhouse later became Crimp Hill House, and then the Old Windsor Unit of the King Edward VII Hospital. In 1940, the additional wards were added at the west of the site under the Emergency Medical Scheme. These are all now demolished. 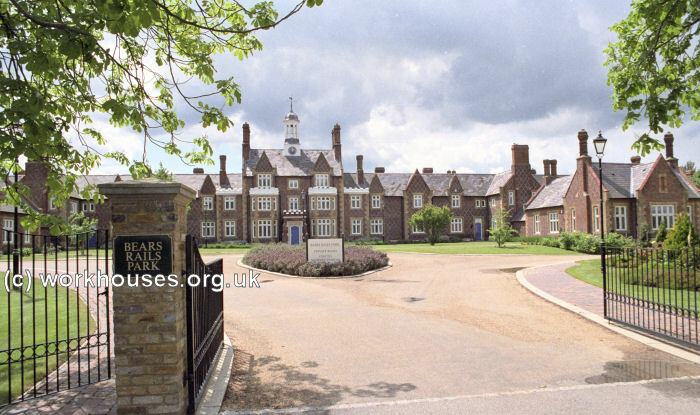 The hospital closed in 1991 and has since been converted to residential accommodation. The Windsor Union operated two cottage homes for pauper children. The girls' home was at 'Ashdene' on St Jude's Road, Englefield Green, and the boys' home at 'Albany House', Croft Corner, in Old Windsor. Neither of the properties now exists. Windsor Albany House site, c.1932. Berkshire Record Office, Berkshire Record Office, 9 Coley Avenue, Reading, Berks RG1 6AF. Holdings include: Guardians' minute books (1873-91, 1894-1930); Deaths (1835-48, 1867-88, 1908-32); Pauper service book (1877-1914); Punishment books (1867-1938); Relatives' addresses (1879-1927); etc. Railton, M (1994) Early Medical Services — Berkshire and South Oxfordshire from 1740 (Polmood Publications). Tighe, R.R, and Davis, J.E. (1858) Annals of Windsor .